Whether through tarot or on the dance floor of life, my purpose is to hold the space for you to move, heal, grow and become who you’ve always wanted to be. I am a tarot reader, guide and teacher. I work with you to have deeper access to your archetypal story so that you can draw wisdom from your past experiences, access the opportunities available to you in the present, and create beautiful paths of possibility and potentiality for your future. My aim as your tarot guide is to help you honor your self-knowing and to champion your self-determination to create the life that you most desire. I am a movement facilitator. I create and facilitate movement experiences that support you in having a more loving, kind, pleasurable, respectful and empowered relationship with your body. I want you to feel vital, whole, strong, flexible, mobile, stable and in harmony with your unique body. Whether it’s through ArcanaDance™, Nia, or Stretch and Fly, I am a masterful somatic facilitator, bringing compassion, playfulness and joy to any experience. My guidance is simple, clear and will allow you to move your body in ways that honor and align with your mental, emotional, physical and spiritual capabilities and values. I am a coach. I work with a limited number of coaching clients that have goals that center around accessing, honoring and expanding the luminosity of their unique spirit. 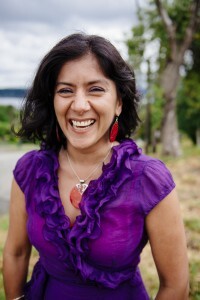 These courageous clients are ready for deep and intense self-reflection, want to connect with their inner wisdom using the full capacity of their somatic intelligence, and desire to learn and hone feminine leadership practices. facilitate experiences that heal, transform and uplift. This lens encompasses my 20+ years experience as an educator, facilitator, program designer, program manager, and counselor in a number of industries including wellness, technology, higher education, customer service, and communications. The mastery of the work that I do is made possible by my life experiences, countless trainings that have culminated in a Black Belt in Nia, an undergraduate degree in Psychology with an emphasis on neuropsychology, and graduate training in Experiential Health and Healing from The Graduate Institute, where I focused my studies on somatic awareness and embodied education. You can find me on Facebook for Movement and Tarot, Instagram and Twitter. Keep up with my offerings via my calendar. Stay tuned for more information. Later this Summer, I will be launching the first online ArcanaDance™ course. In the tarot, The Devil represents the archetype of the shadow. The shadow embodies any part of us that we’ve banished to the dark – the parts of us we’ve denied expression, exposure and discovery. The shadow also reveals to us a complex relationship with power. Who, what, where and how do you give your power over, and at what cost? Somatic means “relating to the body.” The body is not only where we experience life, it is the frontier of our transformation. ArcanaDance™ brings the tarot to life through the body. In this course you will learn about the physical imprint of the shadow as expressed and experienced through the language of the body. 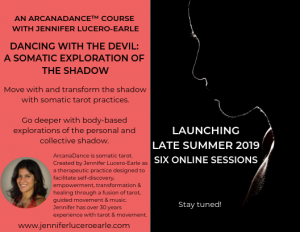 You will also learn how to use and transform the contractive energy of the shadow into something new and more expansive. Join us for six Online Sessions delivered via live sessions (recorded), PDF lessons, short videos, playlists and Q&A in a private Facebook group. More information to come!